With Jane Nightwork Productions you know you’re going to get thoughtful, quality theatre, and so it proves with Shaw’s Women, the latest show from them which is now playing at the Tristan Bates Theatre. If you’ve not heard of the piece, it’s because it’s an umbrella title for two one-act George Bernard Shaw plays that are seldom performed: Village Wooing and How He Lied To Her Husband. The show returns Jane Nightwork Productions to the theme of sexual relationships, but whilst the plays provoke thought and stimulate debate on, for example, the nature of feminism and the author’s view of women, this is no heavy evening at the theatre. Bernard Shaw’s wit and lightness of touch ensure there are plenty of laughs to be had; whilst elegant direction from Robert Gillespie and impressive design from Matilde Mangaroni keep the audience at all times close to the action and immersed in the world of the stories. First up is Village Wooing. Over three scenes, we follow the developing relationship between A (Mark Fleischmann) and Z (Madeleine Hutchins). As the character names suggest, the play runs the gamut of the alphabet of human relationships. A is a travel writer, reserved, cautious, and above the sordid reality of courtship and messy sexual urges (or so he thinks). He’s a character Bernard Shaw appears to know inside-out – and judging by the programme notes, he is almost certainly an extension of the author’s own personality. Z is a village shop assistant; chatty, pragmatic and determined to find a husband. From the first scene it’s clear their personalities are polar opposites, but does that mean they’re necessarily unsuitable for matrimony? Village Wooing: Madeline Hutchins and Mark Fleischmann. Credit: Richard Davenport. The actors beautifully carry off this comedy. Madeleine Hutchins is endearing as Z, and is neatly counterbalanced by Mark Fleishmann’s sardonic, world-weary A. You never lose sympathy for either character, even though Z can be irritating in her persistance, whilst A is occasionally unkind and pompous. 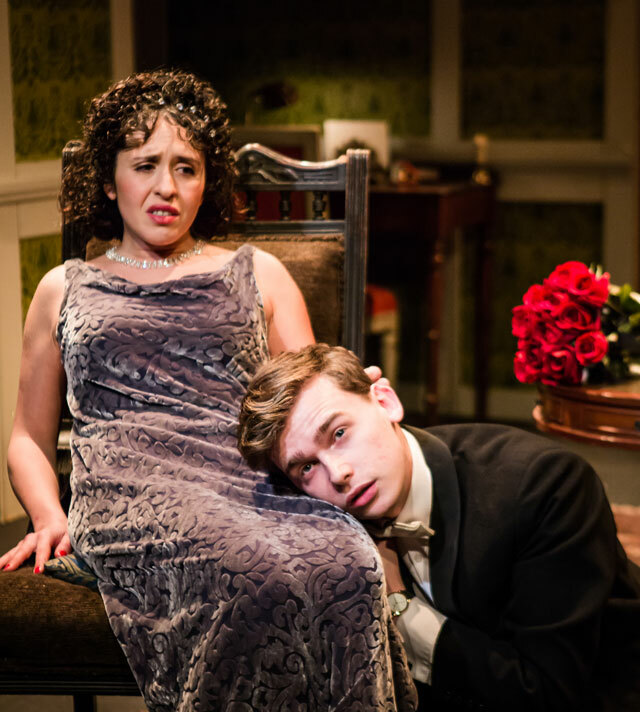 An effective set change part-way through, and the pleasure of seeing A and Z spark off one another again, is enough to forgive Bernard Shaw’s unlikely contrivance in bringing the couple together by coincidence in more than one setting. How He Lied: Josh Harper and Viss Elliot Safavi. Credit: Richard Davenport. The three actors grab the farcical elements of this lively piece from the opening moment when Josh Harper, awaiting the love of his life, sniffs at her gloves with shuddering adoration. The rapidity with which he ‘grows up’ during the play also provides Harper with plenty of comic opportunities, which he doesn’t miss. Viss Elliot Safavi, the catalyst for all the male attention, sets the pace of the piece and plays the apparently doomed heroine to great amusement, gently manipulating her over-amorous admirer. The arrival of Alan Francis ratchets up the drama further still, and he gives a masterful comic performance as the husband in a piece that is ultimately about the over-idealisation of women. A terrific ensemble ably brings to life these two contrasting yet thematically-linked plays. 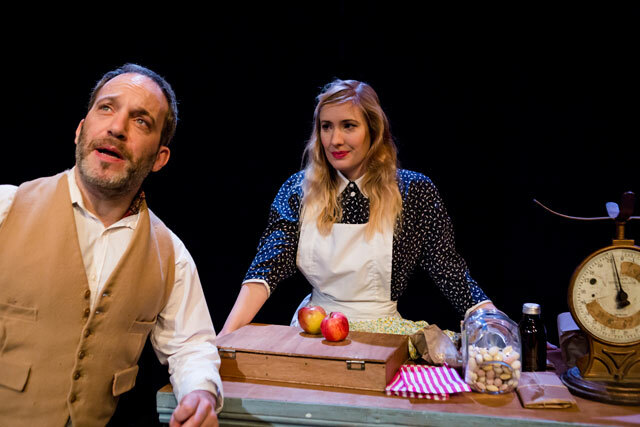 One presents thoughtful wit and an affectionate look at an evolving relationship, whilst the other offers a brilliantly-played farce with a clever twist. It’s well-worth seeing this revival of neglected works from the Bernard Shaw canon. The production pinpoints the subject matter and provides both stimulation and laughs. Check out our interview with the cast of Shaw’s Women.